Congratulations, you’re pregnant! Unfortunately, that first trimester usually brings morning sickness. Not exactly the happiest symptom of pregnancy. I’m on baby #5 right now and I have to say it’s been my easiest in terms of morning sickness. Now of course there are probably a hundred reasons why this time is easier but using natural morning sickness remedies have helped a lot! 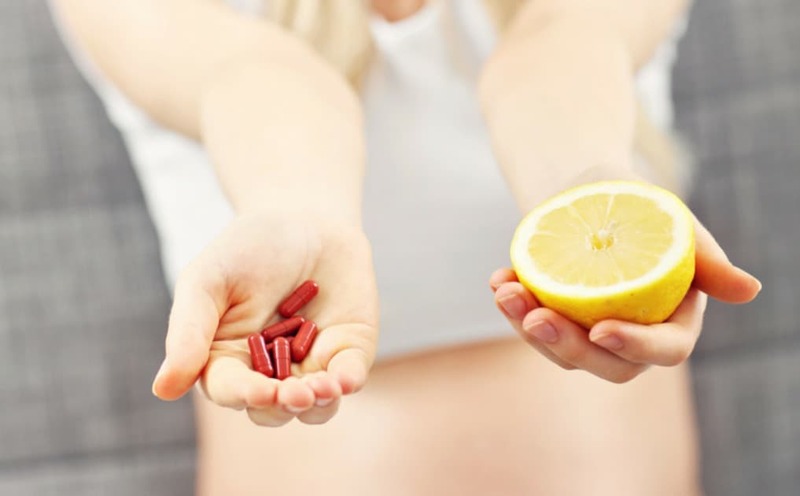 To help YOU get through those moments of queasiness and nausea, I’ve created a list of some great natural morning sickness remedies. Magnesium oil is the new remedy on the block. As it turns out, a magnesium deficiency can cause morning sickness. As most people are deficient in magnesium, many women suffer from morning sickness. This is a topical oil as magnesium oil is best absorbed by the body that way. For best results it’s good to use magnesium oil before getting pregnant to increase your levels but if you don’t get a head start that’s ok. I found that applying magnesium oil to my feet once before bed and once before getting out of bed, did the trick. Odds are you’ve heard of the well known Preggie Pops and many women swear by them. However, sometimes they can have not so natural ingredients and all those lollipops can cost you a bit of money! As an alternative, I have created homemade anti-nausea lollipops and they really take the edge of nausea. Ginger is a popular morning sickness remedy. You can use it in all forms but the popular methods seem to be ginger candies and ginger ale. Much like magnesium, a deficiency in vitamin B6 seems related to morning sickness. In fact, I’ve heard that it’s a deficiency in magnesium that makes our bodies not hold enough vitamin B6… all very interesting stuff. Many doctors just prescribe vitamin B6 supplements and that’s an alright route to go. You can also try to increase your vitamin B6 by eating foods that are rich in this vitamin such as beans, bananas, avocados, and nuts. This tea is the tea to be drinking if you are pregnant. It’s most popular for it’s ability to tone the uterus and shorten labor time. However, it is also great at relieving morning sickness! You can drink this tea hot or cold, it’s up to you! Eating small amounts of food throughout the day will help your stomach stay full and your blood sugar levels stay more constant. Even if it’s just a few nibbles every few hours you’ll feel better than if you held off and only ate during the three main meal times. These bands are worn on your wrists and apply pressure to key points which help relieve nausea. Two of the popular brands are Psi Bands and Sea-Bands. A bit of lemon water can help keep the nausea away. Others find that if they pop a lemon wedge in their mouth when they feel queasy that they start to feel better. Another way to harness lemon’s benefits is to simply smell lemon essential oil! Peppermint has long been known as a tummy calming herb. Make a cup of peppermint tea to help settle your stomach. Alternatively, you can also smell peppermint essential oil whenever you feel nauseous. Yes, I know that vinegar sounds like the last thing on earth that you would want to have when you are feeling nauseous but as it turns out apple cider vinegar can help relieve nausea. So if you can stomach it, try drinking a bit of apple cider vinegar (I like to take 1tbs ACV mixed in 1tbs of water and then chase it down with water as quick as possible) As an added bonus, ACV also helps relieve heartburn! All pregnant mamas are told to take their prenatal vitamins but that can be tough to do during that first trimester. Most prenatals do not taste (or smell!) good and some prenatal vitamins are just harder on your stomach. That’s why I recommend taking a gentle prenatal vitamin; one designed with morning sickness in mind. If you are looking for a good natural prenatal, I’ve got a great list of natural prenatal vitamin options. A few other prenatal tips are to take them at night and/or to take it with food. great list! These would be great as well when recovering from stomach upsets! These are great tips! I made sure to pin and tweet for my readers who will love this post. Thanks.